例1：They really are apples and oranges. 例2：They are both great but you can't compare apples and oranges. 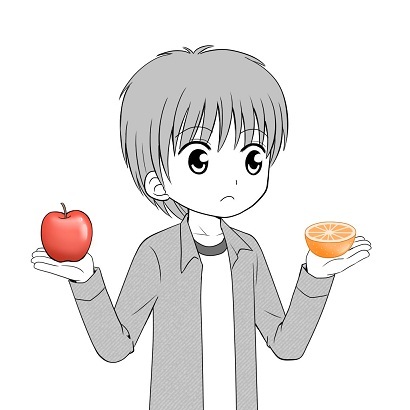 例3：It's a totally different situation, it's apples and oranges. 例：To compare large trucks with compact cars is to compare apples with oranges. Furthermore, comparing Apple to Facebook is comparing apples and oranges. Facebook is a social networking site; Apple is not in the business of social networking. Apple makes most of its money by selling hardware; Facebook sells no hardware. Comparing the plug-in Volt with the hybrid wagon is "ridiculous," said Rob Peterson, a GM spokesman. "Consumers cross-shop vehicles with comparable technologies or functionality, not a new name plate," Peterson said by e-mail. "Comparing Volt to Prius v is apples and oranges." &#9642; The article compares apples to apples, grouping wines of the same variety and price together.